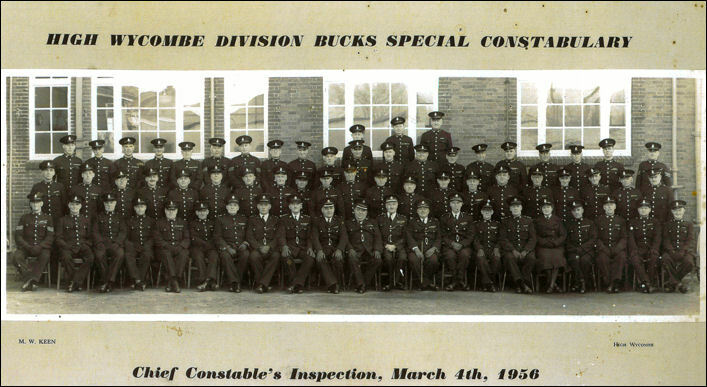 In Alfred Hailstone’s book 'Centenary', written in 1957, 100 years after the formation of the Bucks Constabulary, wrote "The Special Constabulary is now an integral part of the Police Force, having become an organised body only in recent times. 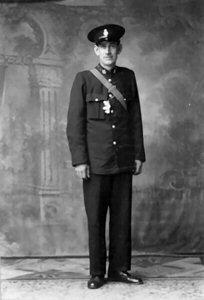 Until the outbreak of the First World War it was the practice of the police authority to enrol specials as and when required. During the war they were organised into companies on military lines with captains, lieutenants and sergeants. Some were in uniform for which they themselves paid. In 1920 the Special Constabulary was completely re-organised on the present day lines. They excelled themselves and in a message to them in June 1945, the Home Secretary said "..........you have responded loyally to all the many calls which have been made upon you. You have given generously of your time and energy..............." Today, the Bucks Special Constabulary plays a most important part in the service of the police give to the county, with members in every town and almost every village. 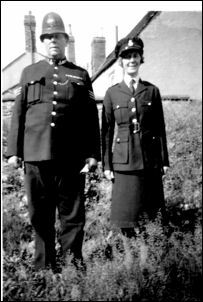 They are always ready and willing to augment the regular force whenever they are needed"
This photograph was found in a charity shop in 2010 in Wendover by David Price a retired police officer and was labelled ‘Wendover Local Police Force’. On the back of the photograph there was some notes that included the name Mrs Pearce, the remainder of the notes referred to the framing of the picture, there was also the number 367. This information was circulated, by email, to retired police officers which resulted in a number of replies from various retired police officers and from the information received and by a process of elimination some of the officers, in the photograph, were named. 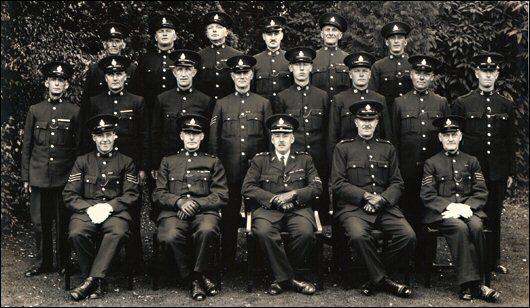 The photograph is from around the time of the Second World War (1939  1945) and is mainly of Special Constables, although there is one War Reserve Constable (part collar number 46- ) and one Regular Police Constable. Middle row - SC Benning (Senior), N/K, SC Daniels, SC J. Pierce, SC Goodson, SC Chaping, N/K PC 277 Leonard Preston. The little summerhouse on The Crescent , Haversham was used during the war as H.Q. 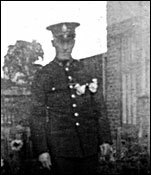 for the A.R.P., Frank Woolley, the Home Guard and the Special Constabulary, my father Joe Brightman and Bert Pooley and Mr (Sgt.) Tattam, who had a sweet shop in Wolverton opposite the Railway Works main entrance, were Specials during and after the War. Their pay in 1940 was 5/- a week plus 3/- War Duty allowance. And of course a free uniform, which had to be handed back in at end of Police Service. One of dad’s last jobs was directing traffic at Silverstone car races. 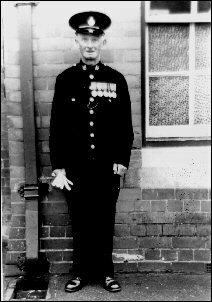 My father finished with a Police Long Service Medal in 1961. This was soon after I was fined 30/- for speeding at 40m.p.h through the village on my A.J.S. motorbike. There was the shame of having ones name reported in the local paper, and dad being a Special. I think that was the last straw for him and he resigned soon afterwards! But he received a nice letter from the Chief Constable thanking him for his services over the last 22 years! Francis Drage had a Fruit and Veg Shop at 4 High Street , Stony Stratford. 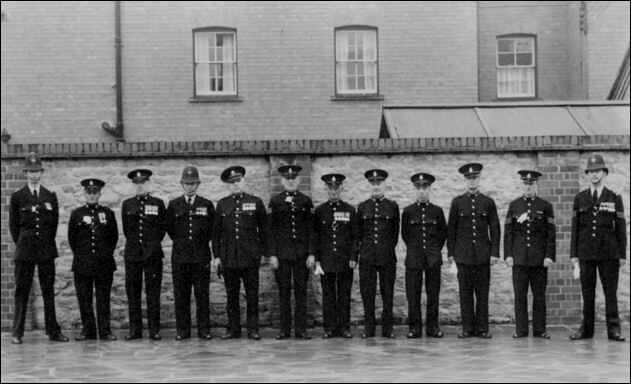 This photograph was taken outside Stony Stratford Police Station around 1950. 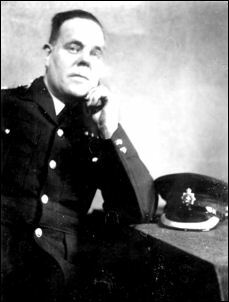 Albert Simms was born in 1888 and joined the Special Constabulary in 1930. He married in 1914 and lived in Calverton, he was a Butcher by trade working in Stony Stratford. He died shortly after this photograph was taken. 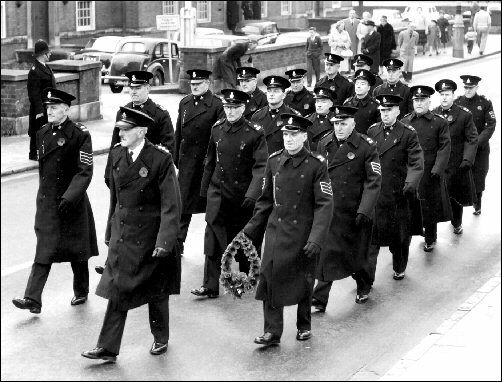 PC 453 Colin Pemberton first left as you look at the photograph SC Albert Simms is seventh from the left and Police Sergeant 246 George Heaps is first on the right.